The type of fruit tree you choose to grow in Virginia should be determined by which part of the state you are in. The state is located between the Appalachian Mountains and the ocean. It is mountainous and cooler to the northwest, which is in the Piedmont region, which has heavy clay soil. As you travel east and south, the state falls away from the mountains to the coast, where the soil becomes sandier in the tidewater region and the weather turns warmer. Select a tree that is well adapted to your soil conditions and USDA hardiness zone. Select a location for your tree in well-drained soil and full sunlight. A hillside works well. Avoid depressions in your property, where water collects. 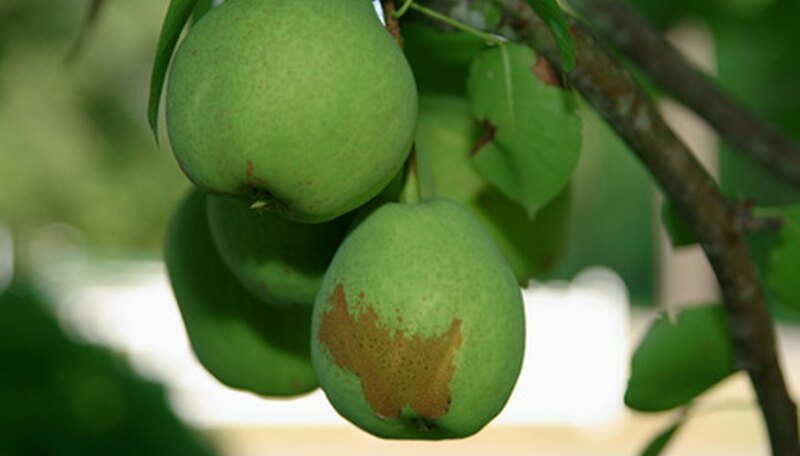 Most fruit trees do not do well in standing water. Collect soil samples from up to 10 locations around your proposed fruit tree bed by digging a quart of soil from each location with a soil augur. Pull weeds, rocks, sticks, roots and grass from the soil samples and place them in a bucket. Mix the samples and allow them to dry. Put a cup of soil into a plastic sandwich bag and take it to your Virginia County Cooperative Extension Service. This agency will send the sample to the Virginia Tech Soil Testing Laboratory for analysis. The test results will tell you what your soil structure and pH are, and the agency will offer recommendations for what amendments to add to your soil. Break up your soil to a depth of 12 inches over a wide area to encourage extensive root development. Spread amendments over your soil in a 4-inch layer. Mix the amendments into the soil with the rototiller. Good amendments for the Piedmont region include organic ones that will add nutrients and aerate the soil, such as compost, wood chips, clover, peat moss and composted manure. Gypsum will help to break up the heavy clay soil. Organic amendments such as compost and peat moss are good choices for the coastal tidewater region because they hold moisture and slow drainage in sandy soil. Add a balanced, granulated fertilizer, because the drainage in sandy soil leaches nutrients from the soil. To adjust the pH of soil, add sulfur to lower it or lime to raise it. Most trees prefer a slightly acid to neutral pH in the range of 6.5 to 7.5. Mix these amendments into the soil with a rototiller. Find out your USDA hardiness zone by consulting USDA hardiness zone maps at your county extension service or at the plant nurseries where you purchase fruit trees. Other good locations for USDA hardiness zone maps include gardening books and the farmer’s almanac. Certain flowering fruits need at least 1,200 hours of chilling time to set fruit. Because of this, most trees that bear fruit early are well-suited to zone 6 in the western part of Virginia, but do not do well along the coast in zone 8. Some hybrid apple, pear and stone fruits will do well in zone 8. For example, Northern Spy apples do well only in zones 4 through 7, while Pink Lady apples do well from zones 6 through 9. Dig a planting hole that is twice as wide but no deeper than the tree’s rootball. Place the rootball into the planting hole and fill in dirt around the sides. Water to dislodge any air pockets and fill in the displaced soil with more dirt. Cover the root zone with plastic weed block to prevent weeds from becoming established in the soil. Weeds can choke out a plant. Keep the soil as damp as a wrung-out sponge to allow the roots to develop during the first year. Gradually taper off watering after the first year when the roots becomes established.